Any one else really counting down the days til summer? It’s usually about this time in the school year that I am just done with the hustle and bustle of the morning. Currently, my son is sleeping in longer making wake-up time that much harder. I don’t blame him, 2nd grade is tough, ha! 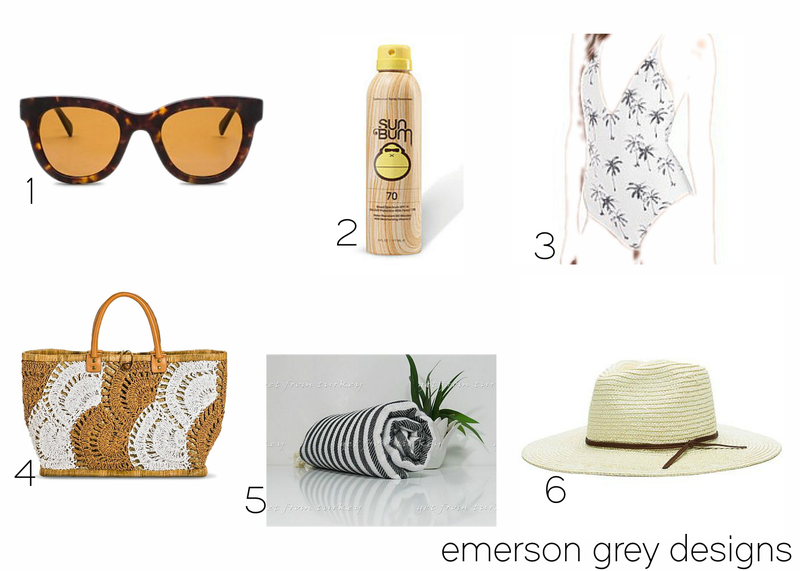 With our first trip of the summer just a short month away I wanted to gather a few of my current, cost conscious must-haves and share them with you all….now just put me by a pool and pour me a beverage! I have to say a few summers ago I switched to using Turkish towels for the pool and beach and I seriously can’t see myself ever buying a normal beach towel again! Not only are these Turkish towels so much easier to fold up in a smaller size than a regular towel, but they also dry so much faster! And even better they get softer the more times you throw them in the washer. And who doesn’t just love a new pair of sun glasses? I love these ones from Otis because their lenses are made with mineral glass making them impossible to scratch! They are a moms dream. I am also a huge believer in wearing a hat always. I’m a natural red head with freckles and fair skin and it is not a good combination when I’m constantly at the beach with my kids. Finding the perfect hat for summer is always a fun shopping necessity for me. Do you have a few items that are must-haves for you? I’d love to hear them…or an item that you just love and feel the need to share.